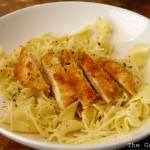 This Copycat Noodles and Company Parmesan Chicken and Buttered Noodles recipe is a quick way to make one of your favorites at home! It has been hard to find the motivation to make meals during the summer! The kids are home from school, it’s hot outside and there is no schedule. So, I was trying to figure out what to make for dinner when I remembered that I had some leftover grilled chicken in the freezer and decided to make a quick version of Noodles and Company’s Parmesan Chicken and Buttered Noodles. I took leftover, grilled chicken out of the freezer, added a little water, covered it loosely and heated it in the microwave until the chicken thawed completely. To use raw, boneless, skinless, chicken breasts instead start by slicing the chicken breasts in half widthwise so that you have two thin chicken breasts instead of one. 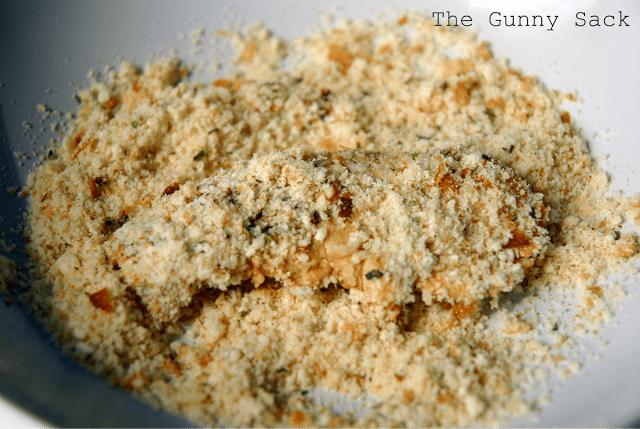 In a shallow bowl, mix together breadcrumbs, grated Parmesan, Italian seasoning, and garlic powder. Heat the olive oil in a saute pan over medium heat. Dip the chicken breasts in melted butter and then coat with the breadcrumbs mixture. 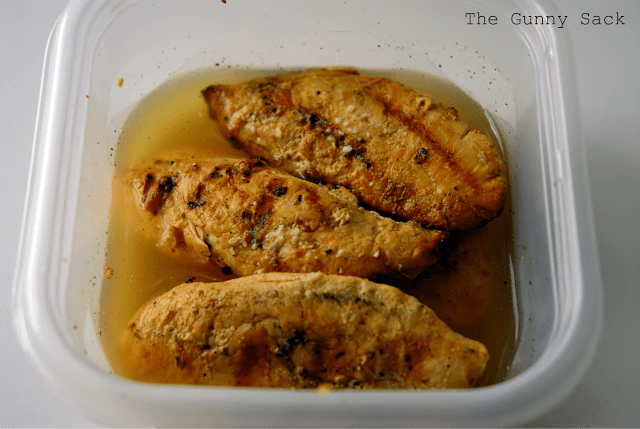 Fry the coated chicken breasts in the oil for a couple of minutes on each side, until golden brown. If using precooked chicken, this will only take about 1- 2 minutes per side. When using raw chicken that has been cut in half to make it thin, this will take 3-4 minutes per side. Cook until the juices run clear or until the chicken reaches an internal temperature of 165°F. Put one cup of cooked egg noodles in three bowls. Toss each with one tablespoon of melted butter. Sprinkle with shredded Parmesan cheese, salt, black pepper, and Italian seasoning. 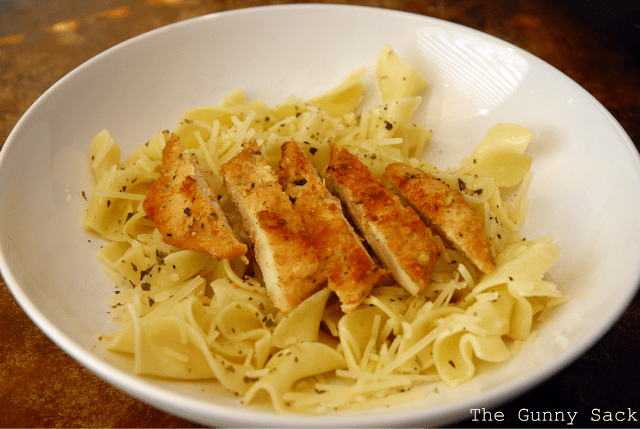 Slice each parmesan chicken breast and lay the slices on top of the noodles in the bowls. 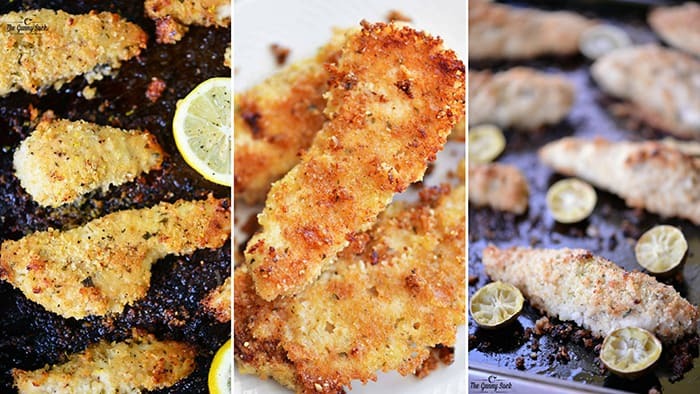 If you want to make oven baked parmesan chicken instead, try the method in one of these two blog posts: Key Lime Chicken Tenders and Lemon Pepper Chicken Tenders. 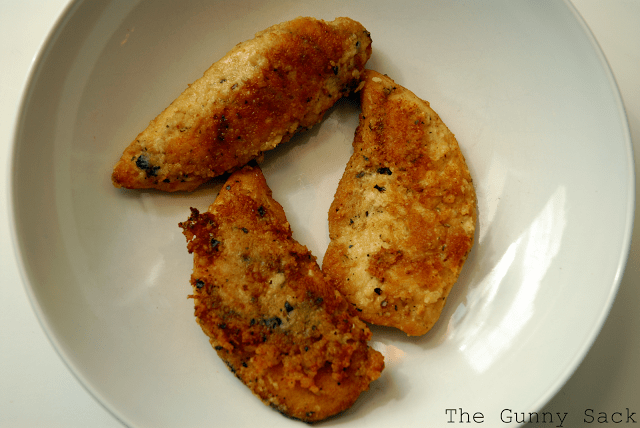 Dip the chicken breasts in melted butter and coat with the breadcrumbs mixture. It will take 3-4 minutes to cooker per side. Cook until the juices run clear or until the chicken reaches an internal temperature of 165°F. 3 cups almond flour, 1 Tbsp baking pwdr, 1 tsp baking soda, 1/2 tsp salt, 2-3 eggs (I buy med. organic), 1-1/2 cups buttermilk/or any milk, 1 small finely diced onion, 1 cup shred cheese, mix, pour into a buttered pan (I use a Pyrex 11X9-inch glass dish & bake 37 mins. T hank you so much. This is an easy dish. I never have any ‘left-over’ chicken in my freezer (since I always use our leftover chicken within a day or so.) I make a cold chicken salad on Croissants (SP) with Butter (Boston) lettuce. It’s nice to have on a hot summer day for lunch! To the breading mixture (for this dish), I added a bit of garkic powder, and also some dry parsley flakes. I also added a generous handful of frozen ‘green peas’ to the buttered noodles. 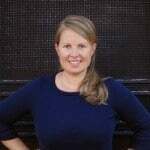 With my ‘personal additions’, we loved it ! . Fantastic! I still make it for my family too! This was delicious I substituted bread crumbs for Original Goldfishes crackers and I served it up with homemade Mac n Cheese. My family devoured it! Yum!! I love parmesan chicken! These look so good and I bet your family loved it! I don’t know how you have time to do all that you do!!! Superwoman!